Seiko Gakuin High School Rocketry Model Workshop | Leave a Nest Co.,ltd. 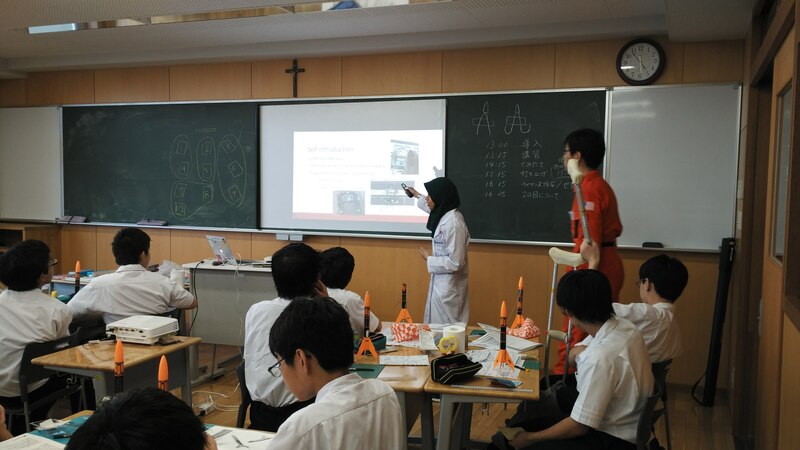 This rocketry model workshop was held on last 9th, 11th and 12th July in Seiko Gakuin High School. Around 45 students from grade 1 until grade 3 of junior high school participated in this workshop. All of the students was cheerful and active during the workshop. Different from Japan, usually students in Malaysia did not ask questions during the lecture. It maybe because Malaysian students are shy to ask the lecturer in front of others. Instead, they will only ask the lecturer privately. In this rocketry model workshop, I was one of the teaching assistant (TA) who assists students when they have problems or questions in making their own model rocket. During the workshop, most of the students had a difficulty in folding the parachute. Some of their parachute string get tangled which may cause the parachute not to function properly during the landing. Maeda-san and I prepared information sheets about model rocket around the world. We put some model rocket competitions that being held around the world and also interesting facts about model rocket. Do you know the biggest and the highest launch of model rocket in the world? And also, how many rocket engines do you think you need to launch the real rocket? These are some of the information that we put on the sheet. During my presentation , one of the student ask me, how much do we need to spend to make the real rocket from the model rocket engines. I’m sure that these students got inspired to make the real rocket after getting some interesting information about the model rocket. Hopefully, in the future, they will be one of the organization that will make a rocket in Japan. On the second and last day of workshop, the students are required to make their own original model rocket from scratch. The goal is to make sure that the quail egg in the rocket does not break during the landing. More than half of the teams managed to save the quail egg. All of them has their own creativity in making the model rocket. They paint the model rocket into pink, red and I remembered one of the team make two parachutes. The students have a great creativity. Seiko Gakuin High School model rocket workshop was a great experience because I had a chance to make my own model rocket and launched it. The most exciting part is when you get to see how your own model rocket soar up to the sky about 100m and then parachute pops up when the rocket start to fall down. And I get my license for launching model rocket too. Hopefully, this license can be used in Malaysia.